Version 2.0 is now available, with lots of enhancements. log your medicines as you use them. Get alerts when to stop, change doses or if you're overdosing. Get help from the Exercise Assistant to set goals and log sessions. See your entire diary with symptoms, events, exercises and medicines in a Time Line display together. Once again, for those of us who suffer from chronic pain, this app is a the most valuable tool ever for keeping track of med use, evaluating patterns of use, identifying cause/effect relationships, and having something concrete to take to Dr appts. Thanks to you and all who developed it and continue to improve it. BTW I absolutely love this app! So does my neurologist. So helpful for her to see the patterns of my chronic pain episodes. I love this app! I did purchase the expansion set and have no trouble using the app and all its functions to keep track of what I need to keep track of. … I love the app and so far it’s working perfectly for what I need. If you have chronic pain you will be familiar with the inevitable ups and downs it comes with. Done too much on a good afternoon? You come to expect to pay for it the next day with a pain flare-up. Been away on a holiday in some hot country abroad? The pain got so much better it almost disappeared - without any type of treatment. Pain intensity is rarely stable - it varies a lot. Sometimes from day to day or even hour to hour, sometimes over much longer periods of time. It’s natural to look out for patterns or triggers to find out what improves and what worsens pain. Some of them are easy to identify (like the above examples) and you can use them to consciously self manage pain. Others are harder to keep track of. They occur infrequently or seem less clear cut in what type of response they trigger. Mood? Infection episodes? Stress? Weather? Diet? Different treatments? Pain medicines…? Particularly when it comes to the effect of medicines (and other repetitive treatments) slow or subtle changes over longer periods of time are difficult to track and remember in your mind. Especially when a blurred memory is one of your problems (such as in fibromyalgia), or a side effect of your medication. For situations like this keeping a Pain Diary can be very useful. A pain diary principally is keeping a record about one or more symptoms as well as events or treatments that are suspected or expected to change them. How to track a symptom? You could use words or descriptions to keep rating the severity or impact. More useful is trying to assign numbers. This system is standard in science and research and is called Visual Analog or Numerical Rating Scale. While it may feel rather strange at first, the principle it simple: Replace words with numbers in a range (usually 0…10) and it will be much easier to graphically track and visualise changes over time. To help at the beginning you can substitute ranges of numbers for words. For example 0 = pain free, 1…3 = ‘mild’, 3…6 = moderate and 6…9 = ‘severe’ and 10 = ‘agonising’. The importance is consistence to make numbers comparable and trackable. 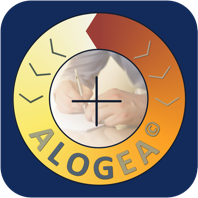 When it comes to reaping the benefits of the labour of keeping a diary, dedicated Pain Diary Apps like Alogea come with a number of important advantages. They can take over (or make a lot easier) the difficult job of reviewing, sorting and analysing the accumulated diary data to try to make sense of your records. They can present the diary data in different forms and formats for you and health professionals to see and use when making decisions about treatments and how to optimise self management. These include graphical views, statistics and an accurate list of treatments and medicines, with doses and times, to name just a few. Seeing your symptom severity displayed graphically can make it much easier to detect the impact of recurring events or medicines. If this has triggered your interest take a look at Alogea. 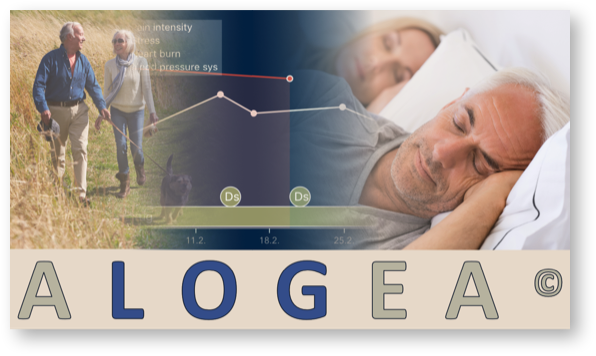 Alogea will focus from the beginning on finding out more about the impact of medicines, treatments and events on your pain and related symptoms. It keeps the effort of rating symptoms to a minimum so that you can rate more frequently. This in turn will give a more accurate picture of your situation. The App has multiple powerful analytical tools to help you monitor and decide how useful different medicines are. People with Chronic Pain or other long term symptoms who wish to keep a diary and track symptom changes over time. Unlike other Medical Diary Apps, Alogea is focused on the impact of medicines and events (such as treatments, exercises or any other events you chose to record) on symptoms. It's best used when a diagnosis has already been made and treatments are about to start or are under way. In this situation recording lots of symptom details - as other Diary Apps do - is not so important any more. Instead, rating easily = frequently is more useful to detect changes as a result of medicines, treatments or events. If pain limits your mobility and reduces physical fitness use the Exercise Assistant to set and achieve goals and improve self-management. Try it - Alogea is free to download and use for one symptom and medicine.